Teletubbies usually runs on the local stations. Its a very good program for babies and very young toddlers. 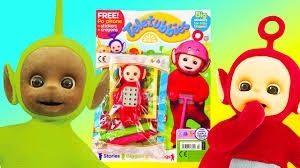 They love “Nunu” which is the teletubbies little vaacum cleaner. Teletubbies love to hug and dance and play. Each episode features a real life piece, with a little scene with children in it, then they do it “again” and repeat the scene once more. There is a smiling and laughing baby in the sun. Flowers are always growing, and rabbits can be seen hopping around. I would recommend “Teletubbies” to anyone with a baby or baby on the way. Its a welcome break from todays more aggressive cartoons. Check your local programming for running times. TV Series Modern Family "Caught in the Act"
Me for myself I definitely recommend this. Specially for children or babies who love cartoons . But babies would love it be cause it s very colourful and very easy for baby s to play with .